Today’s first lesson was the beginning of a special course I am teaching for a term at Kingham Hill School. The students in attendance were between the ages of 16 and 18 years of age. The course was trialled last term with a good response. The agreed content was self-protection moving into Mixed Martial Arts. Today we addressed the legalities of self-defence, including when it is permitted to use a pre-emptive strike as well as other soft skills such as awareness, attitude and controlling fear. I have provided a few useful links below for more detailed study. With the soft skills addressed we began work on building protective barriers, known as the fence. This concept, first articulated by Geoff Thompson, is used to determine the physical intentions of an antagonist. I encourage people to maintain awareness of their personal space as a habit. This can then be built upon as effective counter-assault behaviour, where the person using the fence has a fairly robust gauge on the physical intentions of an antagonist. 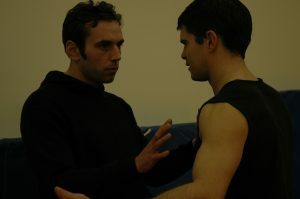 From here he or she can try to dissuade the antagonist or negotiate a means to extricate themselves safely from the situation without resorting to violence. However, if the fence is breached the defender is ready to launch their pre-emptive strike. We trained the above using a progressive type of role-play. Students were trained to understand that provided the antagonist wasn’t armed and they stayed behind the barrier the situation was unlikely to get violent. They then trained the striking response. This is a rear hand straight strike. These were trained to target the antagonist and then practised on the focus mitts. Focus mitt holders were taught to coach effectively by combining role play, bracing the focus mitt and moving backwards whilst the mitt was struck. The lesson finished with transitional striking, moving through postures – lying down, sitting up, kneeling up and standing.